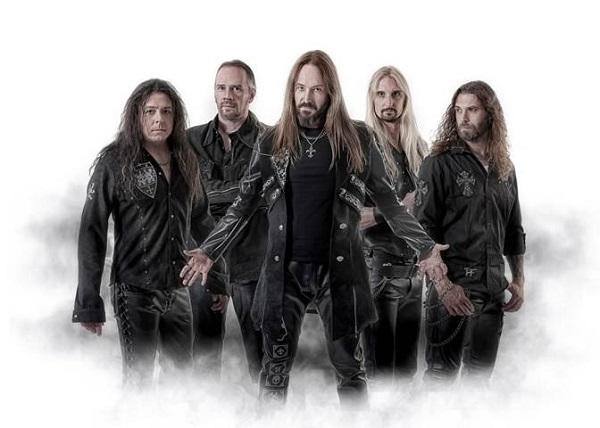 If ever there was a band that became a surprise story in Metal, it would be Hammerfall. While the band has never really put out a bad album, the material the band puts out is Heavy Metal in it’s most traditional form, right down to the stereotypical lyrics. And yet, the band manages to take this approach and give the songs enough of a bite, driven with music that is heavy or passionate enough that it feeds into the lust of Metal fans for something good and enjoyable in its rawest form without all the gags and gimmicks of today’s acts. The only gimmick is that this band feels like the ultimate good to the world of Metal, but not necessarily in a “constantly positive” or “Christian” lyrical approach, but with the somewhat lighter vibe of the music. The band formed back in 1993, and for 2011, just shy of their twenty year anniversary, the band brings us Infected, their eighth full-length, and it’s nothing more than the same, but that same is nothing but solid Heavy Metal with the hook only Hammerfall can bring to the mix. Infected actually feels like an homage to themselves in a sense, bringing a collection of songs that nicely mix the approach of their earlier material with their more recent material that was often a little lighter in comparison. “Dia de los Muertos” captures the heavier, faster sound of earlier releases like Glory to the Brave and Legacy of Kings, having some pounding drumming that nicely keeps the pace against the faster and more intricate Heavy Metal guitar performance with strong background guitars and a bass that keeps the rhythm perfectly, adding a little richness to the music overall. The guitar solo of the track is impressive with its faster pace that switches to a slower melody-driven section of notes that perfectly match the sound of the song. “Bang Your Head”, however, is the prime example of a more modern-day Hammerfall with its heavily melody driven material that just feels a lot lighter and generally seems to lack the bite and general aggression of the earlier material that winds up being showcased on “Dia De Los Muertos” and similar songs. “Patient Zero” makes for a nice start to the album, but the introduction to the song takes forever, though sets up the whole idea of an infection that the album name and artwork give off, as well as the music video for “One More Time” and it’s usage of zombies. However, it becomes a subject that, outside this track, never is touched upon again. The music for this track works well with the concept, having a heavier vibe to it’s more heavier, groove-like riffs that breathe that Heavy Metal aggression, though the chorus itself feels a little more melodic in comparison and seems a little boring compared to the harsher and brooding music that appears everywhere else on the song. Of course the track “One More Time” was the first single and it’s a rather catchy anthem-like track from Hammerfall that just sounds heavy and has a strong enough presence and beat to it that it becomes lodged inside your head. “Send Me a Sign” is a well executed Heavy Metal power ballad that shows a lot of passion in the vocals, though nothing too over-the-top or dynamic for the group, and “I Refuse” comes off as another anthem that is clearly geared to get a reaction from the audience at their shows with its slower pace and many moments that slam in with the momentum to throw your fists into the air along with it. As far as anything negative goes, there’s really nothing bad at all about it. The material here is all solid, and often has some varying elements going on with the music itself. “666 – The Enemy Within” has a few moments that seem to clash, having a charging, chugging style that hits prior to a heavily melodic chorus that is very short, then will go right back to that chugging style for an extended period of time, then back to the short chorus. This happens towards the end, and the song itself just doesn’t really seem to work thanks to those dramatic jumps, and other that occur in the song. 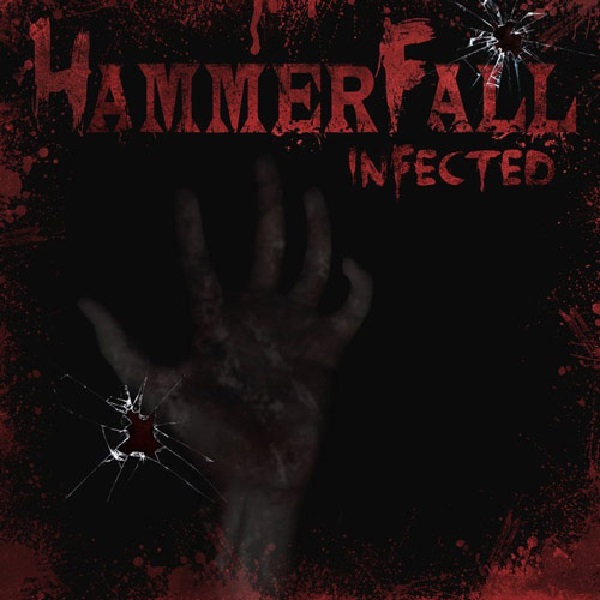 Other then that, the music is just traditional Hammerfall, and doesn’t really offer anything new or exciting to the mix, plus the lack of focusing on the introduction “infection” concept is a little disheartening too. But in the long run, it’s Hammerfall at their best. If you like the band, or just traditional Heavy Metal, then you’ll find delight in this album. While the group doesn’t really do anything that different, there’s never a dull moment, and each track is handled well and performed with a decent amount of energy to them. But, again, it’s basically the same sound you’ve heard seven times before, except it hasn’t evolved in any way other than to take the best ideas of their original material and mix it with the best ideas of their more modern sound. This does lead to some tracks that stand out more than some of their other material, though not that much. In the end, Infected is just solid traditional metal. It’s heavy, it’s catchy, it’s what you would expect. It’s Hammerfall, pure and simple.